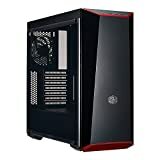 If you are thinking of assembling a new computer from scratch, you want to upgrade your build, or you want to overturn your configuration, you should seriously consider the possibility of changing case. In fact, the case is one of the fundamental elements in a configuration! First of all, it is the case of the various hardware components, including motherboard, processor, graphics card, power supply; its task is to protect the parts of the PC from dust and external factors, such as heat. 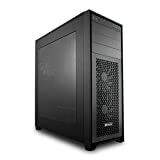 Airflow (the flow of air inside the case), which ensures an environment that is always fresh and clean by means of fans. 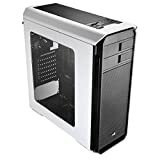 The dimensions, which depend on the internal components (if we choose a mATX motherboard, we can very well reduce the size of the case, on the contrary, if we use an ATX motherboard, we need a bigger case). The amount of case, which allow us to insert more or less peripherals such as Hard Drives, SSD, DVD players or other. The aesthetic factor, which depends on the user’s taste, which considers the color, the shape, the weight, or if it is a window. After this brief introduction, let us enter into the merits of the question. The case, which we said was the accommodation of all the components, has very simple assembly rules. In fact, assembled the block formed by the processor, RAM, GPU (optional) and motherboard, we insert it in the case. Once checked that the I/O panel (the one with the USB, HDMI, audio ports) exactly matches the recess space on the rear panel, screw the motherboard with the screws already in the package. Then we also insert the power supply (usually in the lower left) by screwing the façade outwards that will allow us to turn the system on or off, and to connect the power cord. We use the wiring present in the package to feed the various components. Placed the various disks (HDD, SSD) in their case, we connect via SATA the memories to the motherboard and the power-supply cable to the power supply. As for the fans, simply screw them into the appropriate spaces and connect them to the motherboard. Devices such as power button, reboot, USB ports and audio jacks have a separate discussion. We can observe that these must be connected to the motherboard in order to work. Usually, the place where you place the pins to which you connect the cables is at the bottom right of the board, where it says ” Panel “. By following the instructions provided by the motherboard in order, we will be able to connect all the peripherals in an optimal way. The market offers a vast amount of case, each of which has its pros and cons, its own style, its size, its price. Let’s see what are, then, the best case by price range: low, medium and high. The king of the low end is undoubtedly the AeroCool Aero-500, a mid-tower case with dimensions of 17.3 x 7.5 x 18.9 inches, which supports motherboards from the M-ATX and ATX format. Leaving aside the technical specifications, this case is really good in relation to the selling price. Even outwardly it is very pleasant to see: the design is very minimal, neutral, and there are some goodies like the grid for the power supply and very large spaces for the passage of cables. 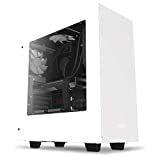 Another undisputed colossus is the MasterBox Lite 5, the home of the Cooler Master, which not only offers a more appealing design, but also offers slightly more accessible spaces, obviously at a higher price. The dimensions are 18.5 x 7.9 x 17.9 inches, we are talking about a mid-tower that supports motherboards such as m-ATX, M-ATX, ATX. It is possible to install 3 memories of 3.5 inches and one of 2.5 inches; while the fans supported in total are 4: 3 on the front, 1 on the back of 120 mm (or 2 on the front of 140 mm), of which the back is already included in the case. On the front panel, there are 2 ports for the microphone and for the audio and 2 USB 3.0 ports. Certainly, this case aims a lot on the aesthetics: there is also a windowed panel and the possibility to change the red insertions with others already present in a black or white box. A feature not to be underestimated is the presence of dust filters, which do not allow dirt to enter very easily. The Corsair Spec – 03 is a large and heavy casinos, we are talking to about 19.4 x 16.8 x 8.5 inches in size, and weighing 5 kg (empty, of course). 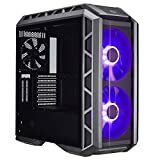 Even this mid-tower supports m-ATX, M-ATX and ATX, but the peculiarity of the Corsair case is that it is already equipped with two LED front fans, selectable in various colors (white, red, orange, blue) and of a back; but it supports two more on the top and one on the back. GPUs and CPU coolers are certainly not a problem, since the side window is also curved outwards. You can insert 3 – 3.5 inches drives and 2 – 2.5 inches drives. There is also a dust filter, 2 USB 3.0 and audio and microphone jacks on the front panel and the power / restart buttons. Modern, powerful and with an aggressive look, this Spec – 03 does not miss anything. Internal Bay: 3x 3.5", 2x 2.5"
One of the most minimal and most appreciated houses on the market. Large 18.7 x 8 x 17 inches, its dimensions are quite small, and they praise the elegance of the materials. Supports M-ATX and ATX motherboards, 3 – 3.5 inches and 3 – 2.5 inches drives. It is equipped with a fan on the top panel, but we can insert 2 on the front and 1 on the back. There are also 2 USB 3.0 and audio and microphone jacks. The interior of this case is the real strength: it is possible to hide the power supply, the motherboard cables and the video card perfectly thanks to the bulkheads. This minimal set-up is usable thanks to the side a panel with window. Another great home from Corsair. We speak of a good 8.2 kg distributed in 16.74 x 8.46 x 18.26 inches. Despite being a mid-tower it supports, in addition to the m-ATX, M-ATX and ATX cards, also the E-ATX. We can insert 2 – 3.5 inches and 3 – 2.5 inches. The fans already present are a 140 mm front and a 120 mm rear. In total, 3 – 120 mm or 2 – 140 mm fans on the front panel, 2 – 120 mm or 140 mm on the top panel and a 120 mm fan on the back can be inserted. What makes it special? The possibility of housing 360 mm radiators and the completely transparent side part in plexiglass. Far more minimal than its younger brother Spec – 03, the Carbide 400C tries to achieve the simplicity of the NZXT S340, but in its own way. The most monumental of Corsair houses. This 21.4 pounds large 21.5 x 9.3 x 22 inches. Full Tower not only accommodates motherboard formats introduced before, but also supports XL-ATX. The expansion slots are infinite, we can insert 3 hard disks, 4 SSD and 6 combo to choose between 3.5 inches and 2.5 inches drives. There are 3 – 140 mm fans already included, in total we can insert 2 in the front panel, 3 on the top panel, 1 on the back and 2 on the bottom. There are 2 USB 3.0, 2 USB 2.0 and two jacks, audio and microphone. This mammoth case supports 240 mm and 360 mm radiators, what makes it special is its silence and harmony of shapes and materials despite its size. If you are looking for a high-end gaming theme, you should definitely consider this Cooler Master H500P. 21.4 x 9.5 x 21.3 inches in size, you can install 2 HDD and 2 SSD, supports any motherboard format except the XL-ATX. The RGB fans are the particularity of the case, there are 2 by 200 mm of default, and we can install other 2 of 200 mm or 3 of 140 mm on the top panel and a 120 mm or 140 mm on the back. It supports Asus Aura Sync, MSI Mystic Light Sync, and Gigabyte and ASRock systems.